Instore allows you to track customers in your own Customer Database, with little to no work required by your employees. 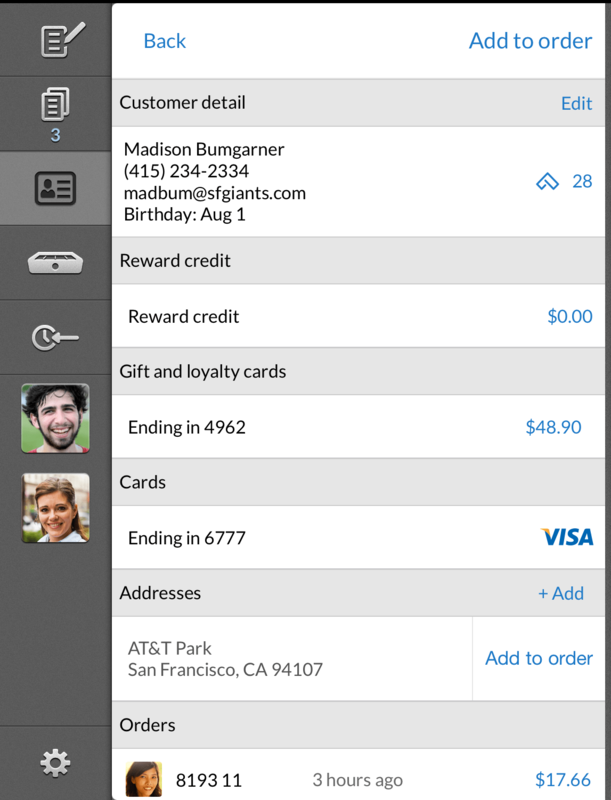 Market your business by emailing more receipts (and save paper in the process). Instore now remembers email addresses, so you’ll find it easier to send receipts digitally. Open tabs with the swipe of a credit, gift or rewards card. We’ll store the customer information for you. Speed up phone orders by looking up customer records quickly. Begin storing customer order history and active credit cards in ways standalone loyalty programs can’t. Add date of birth information and Notes to any customer record. Reward customers for their loyalty without repeated data entry. In the future, as you collect email addresses for your customers, connect with them directly. On the Bill screen, you’ll see that we’ve added a Customer Database button (third from the top on the left-hand side). Once on this screen, you can look up customers by name, phone, email, or address. You can even swipe a credit/gift card on the Bill screen and Instore will pull up the associated customer record if one exists. When you select a customer record, we’ll associate that customer with the order for tracking purposes and pre-populate the email receipt field if an email address is included in the customer record. If there’s no email, ask the customer if they’d like to add one on the receipt screen! Customer search is great for Take Out and Delivery scenarios as Instore will retain delivery address(es) with customer records and pre-populate the customer’s address field when Delivery is selected. Credit card swipe for payment associates a tokenized credit card number and customer name with an order (and all future orders on this card). You can also swipe a credit card when opening a tab to search for or create a customer record and associate it with the order. Customers that sign up for Rewards create their own records. Email address entered on the receipt screen associates an email with an order. Email addresses in your database can now be searched on the receipt screen. Gift card swipe associates a gift card with a customer record. Note that swiping a gift card on the Bill screen allows you to add customer info to the card, check the balance, and add funds. You no longer need to have a Gift Card item to initiate a gift card lookup or load. Simply swipe on the Bill screen. Click + Add new customer on the Customer Database screen, input customer information, then click Done. To learn how Instore’s Customer Database integrates with Instore Rewards, click here.